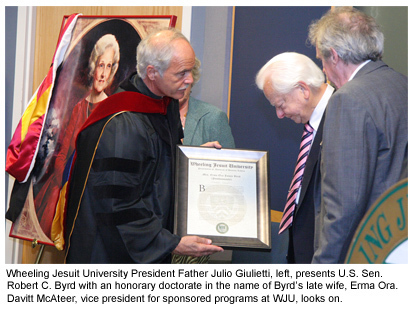 The Erma Ora Byrd Center for Educational Technologies honors the late wife of U.S. Sen. Robert C. Byrd of West Virginia. Married to the senator for almost 69 years, Mrs. Byrd was known for her dedication to the children of West Virginia, her passion for education, and her strong support of public service. 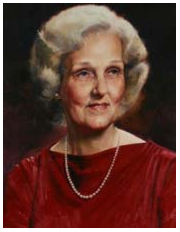 Mrs. Byrd's formal portrait (left) hangs in the entry hall of the Center for Educational Technologies. The building was dedicated in her name in 1997. Wheeling Jesuit University honored her with a posthumous doctorate of humane letters in 2007 for her dedication to the children of West Virginia, her passion for education, and her strong support of public service. Sen. Byrd accepted the doctorate of humane letters in a ceremony at the Robert C. Byrd National Technology Transfer Center on Wheeling Jesuit's campus. Mrs. Byrd died on March 25, 2006, at their home in McLean, VA.
"Erma would have been so proud to receive this honorary degree," Sen. Byrd said in the ceremony. "She never ver attended college; her formal education ended after graduating from Mark Twain High School in Stotesbury, WV. But in life, she was at the top of her class. She would have been especially proud that the degree came from Wheeling Jesuit, a university whose motto is 'Luceat Lux Vestra—Let Your Light Shine,'" Byrd said. "It's a pleasure to posthumously bestow this honorary degree to the late Erma Ora Byrd. We honor her contributions to West Virginia and the differences she made in society," said the Rev. Julio Giulietti, S.J., president of Wheeling Jesuit. Erma Ora Byrd was born in Floyd County, VA, and moved to the West Virginia coalfields with her family. She met her future husband while both were in high school. Erma and Robert Byrd were married when they were just 19 years old. The daughter of a coal miner, Erma Ora Byrd met presidents and senators, kings and queens, and other celebrities. Yet, she never lost the commonsense values that she gained growing up in West Virginia. Mrs. Byrd never sought the limelight. She did not give her first media interview until 1982—30 years after her husband was first elected to Congress. While raising a family, she strongly supported her husband's public service career. After serving in the West Virginia Legislature, Robert Byrd ran for the U.S. House of Representatives, winning election to the 6th District seat in 1952. Soon after he entered Congress, Rep. Byrd enrolled in law school—something he said he could not have done without the patient support of his wife.